This cake was made for one of Rodney's co-worker's son, Wilson, for his 2nd birthday. 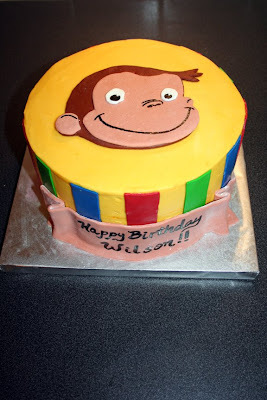 Wilson is having a Curious George themed party and this was our take on a cake that I found online. The original cake was yellow with brown stripes but Mom wanted more of the primary colors incorporated into the design. This is what I came up with! The cake is vanilla with vanilla buttercream and fondant accents! Aww! That's very sweet. Great job.